My Grandfather, Captain John N. Douglas Commanded the 317th Supply Train, 92nd Division (Colored), November 1917 - March 1919. 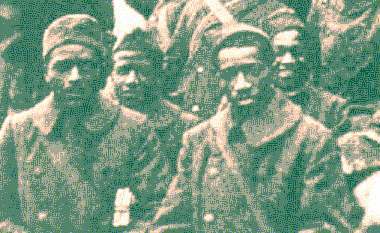 They served in the Vosges, Argonne & Marbache sectors of France. John was born in Wales, emigrated to the US in the late 1880's. He served in US Navy 1900-1904 aboard the cruiser USS Buffalo during the Philippine Insurrection and in the US Army from 1917 to 1947 through both WWI and WWII. Awards included Legion of Merit. He retired as Colonel in US Army Air Force. I always thought it was cool that after he came to the US from England, he served "on the sea", "on the ground" and "in the air corps" in three different wars. 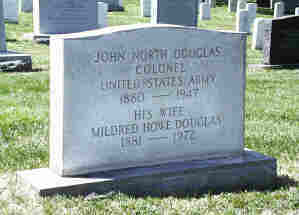 He is buried at Arlington National Cemetery. 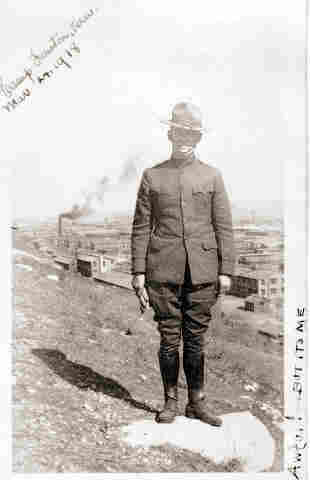 He was at Camp Funston from November, 1917 until June, 1918 while the 92nd Division was being formed. They left Camp Funston in June for France. I think the big Spanish Influenza Pandemic really hit Camp Funston just after they shipped out for France, and the people in his Supply Train were not infected. According to his diary, however, he was confined to an Isolation Camp (also called a Detention Camp) at Camp Funston from December 11, 1917 until February 8, 1918 because of another health issue -- "meningococcus". His diary entries for that period are interesting. Dec. 9, 1917. Spent the day with my family in Manhattan, Kansas. Dec. 10, 1917. Working hard clothing the men. Dec. 11, 1917. Was much upset today to receive at 1:00 p.m. an order stating that I was a carrier of "meningococcus" and that the ambulance would call at 1:30 to take me -- together with Capt. Jones Kurtz, and Lt. F. I. Walker to the isolation camp. Oh -- hell! 2:00 p.m. (same day). Arrived at isolation camp, Ft. Riley and assigned to pyramidal tent No. F-22. Tent is dirty -- and cold. There is a Sibley stove in place, however, and we immediately proceed to clean up and build a fire. Kurtz had gone to Manhattan to meet his wife before the order was issued so did not come out with Walker and yours truly. He came in about 5:00 p.m. We are much perturbed. Dec.12, 1917. Isolation Camp, Ft. Riley, Kansas. We were all marched to an old kitchen today and a culture taken. To do this the “medic” takes a swab and pushes it down your nostril until he touches bottom, then twists it and makes a smear on a culture. Not a pleasant proceeding. Otherwise we are left very much alone. The supply Sgt. came and issued a bucket and three blankets to each of us. Dr. Dronell from the 355th Infantry came this afternoon -- another "carrier." Dr. #1 swabs your nostril back to your throat with 1% silver nitrate solution. Dr. #2 repeats the swabbing all around your throat. Dr. #3 using a crooked swab gets all around your back nostrils behind your palate. Dr. #3 repeats with iodine in liquid petrolatum. Dr. #2 does the same. Dr. #1 does the same. Then your treatment is complete. Tears come -- you gag and almost vomit -- and then you sneeze -- and sneeze -- and blow -- blow -- blow-- your nose and damn your misfortune. I can’t understand how any self-respecting “meningococcus” would stay after one treatment. The nights are cold ( zero or below ) but I manage to keep warm excepting my ears and nose. I have on my bed ten single blankets and am comfortable. I crawl under the pile and hibernate until morning. Dec. 14, 1917. Got another treatment this morning. Spent rest of day firing the stove and alternating roasting one side and then the other. A tent cools quickly. Dec. 15, 1917-Feb. 8, 1918. Was finally discharged from detention camp and returned to duty. Camp Funston, Kansas. Organized and trained the 317th Supply Train. Hard work but conducive of results.